There have been numerous odd trucks and truck-based SUVs in the last couple decades, many in the pursuit of power or "sportiness." Some of the obvious ones are the various editions of SRT, SVT and SS badges attached and they've all been insane ideas with varying results. A couple of these experiments came into mind and, sure enough, they're still for sale in various parts of the county. So let's ponder. 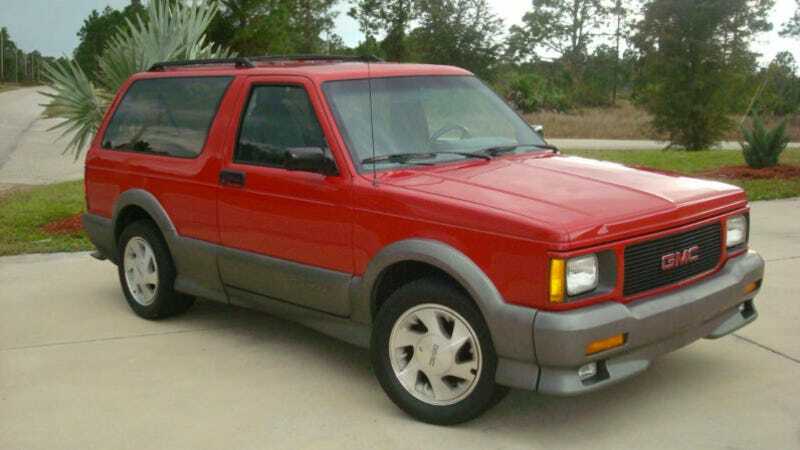 Chief among those lunatic SUVs was the GMC Typhoon. Only GM would think in the early ‘90s to take their low-tech-high-profit Blazer/Jimmy utes and find new ways to doll them up. Some were tasteful, like the Oldsmobile Bravada that wasn't like any Oldsmobile but did sort of pave the way for the modern luxury SUV. You couldn't call the Typhoon tasteful, really. Nor could it be rational, no matter how many times husbands tried to convince their wives otherwise. This Jimmy two-door is lowered, given big wheels and a body kit, with bucket seats and a floor shifter inside – yeah, sporty! But seriously, age has softened the Typhoon into something that could almost be called subtle when you compare it to modern SRT Grand Cherokees or X5Ms, or even ordinary Escalades and GLs with badges too big for their grilles. Also considered "subtle" by today's standards is the engine, a 4.3-liter V6 used in GM trucks forever, but it shows up here with a turbo and 280 horsepower. Hot. I'm sure it still makes for a quick blast down a straight line and, um, entertaining in the corners. This particular red 1992 example only has 81,000 miles, which is why it's going for a stiff $11,000. But they are relatively rare, and the attraction is kind of strong. It's a GMC with a turbo boost gauge! Are we at the point where early ‘90s GMs can be considered nostalgic? But there's something rarer and a somewhat odder concept – no, not the Grand Cherokee Orvis Edition. I don't know if I've ever spoken to someone about a Saleen-ed Explorer. A Saleen Mustang, sure. Which is why I was kind of shocked to find this 2000 Saleen XP8 at all, considering it's one of 125 made between 1998 and 2001. The fact GM made about 10 times as many Syclones is more of a statement that the Saleen Explorer was a really stupid idea. Saleen Mustangs were a big thing around these years and the marketing people probably got together and thought, "Yes, let's take the carpool-oriented Explorer and hot it up!" Saleen took a few Explorers with the 5.0-liter V8 and all-wheel drive and lowered them, put 18-inch wheels on and some stickers, fake carbon fiber and … that's about it. Some came with a supercharger that was more worthy of the Saleen badges, but this particular one looks like a standard setup. It's all kind of tacky outside and in, though, and not in a bizarre way like the Typhoon's, but it's just poorly thought out. The seats are the same, squishy thrones from an Eddie Bauer edition, the dash has crappy fake carbon fiber (trend-setting?) and the side graphics are kind of tame. I think this may be an example of a car that works better as a die-cast model on a mantle rather than something you can actually drive. I'd have the Typhoon in a heartbeat, and even looking at the pictures of this one more and more, I can say I'm starting to become fond of these things. The Saleen Explorer? I think everyone would like to forget that one. But maybe there are some Jalops who are fans of the bizarre fling that was the XP8. Anyone out there? Anyone?